This started out as a boeuf bourgignon but I didn't have any red wine so I made it up as I went along, using white wine from a bottle that was already open and throwing in half an orange I had in the fridge from a previous recipe. It tasted delicious! To serve two: take a packet of cubed casserole steak and brown in a frying pan. Chop a few rashers of bacon and fry as well. Then place the beef and bacon in the slow cooker along with some chopped onion, red pepper if desired, a squeeze of tomato puree, 100ml white wine, 250ml beef stock (made from a stock cube), a dash of orange juice or the squeezed juice from half an orange, and an entire orange half. Cook on high for about 3 hours - depending on the settings of your slow cooker, you could also put this on the lower setting for a longer time. When the dish is cooked, strain the cooking liquid into a small pan and mix with 1 tsp cornflour. Bring to the boil, stirring, until the sauce has thickened. Pour over the beef and serve - this goes well with mashed potatoes and green veg. 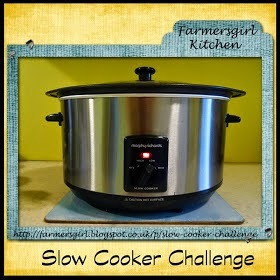 I'm sending this to the Slow Cooker Challenge, hosted by Janice at Farmersgirl Kitchen. Perfect recipe for the slow cooker, thanks for joining in the Slow Cooker Challenge.